Most people have been aware of the environmental benefits of car sharing for some time but it’s now becoming an even more attractive option. In many areas across the country, car-sharing lanes now give priority to cars with multiple occupants at peak travel times – while cars with just a driver wait impatiently in a congested – and very slow moving lane - alongside. The idea was that by offering a faster journey to car-sharers, commuters would have an added incentive to travel their daily route with friends or work mates. There have been some criticisms of the new car share lines, which are officially known as HOV (high occupancy vehicles) lanes. Motorists in some areas say that the lanes increase congestion and travelling time for drivers without passengers by forcing them all into a single lane instead of spread across two lanes as would have happened in the past. Initially many drivers flouted the new rules and in some areas, cameras have now been installed to catch those wrongly using the car-share lane. This has led to a number of prosecutions across the country. Apparently, the most popular ruse is to place a large doll on the front passenger seat in a bid to fool the cameras. The first car share lanes tended to be on city ring roads and other routes which tend to be congested at peak travel times but the scheme is likely to be extended to many motorways. 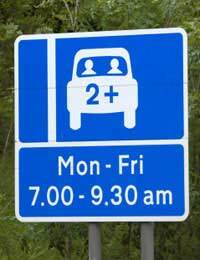 The first motorway car share lanes were introduced in 2008 on the M1 and the M62. Prior to its introduction, a traffic survey conducted on a congested junction of the M62/M606 revealed that more than 80 per cent of drivers at peak times were travelling alone. It therefore makes sense that car sharing would dramatically reduce congestion and traffic delays. Unfortunately, the lanes have so far not proved as popular as predicted and many environmental organisations have recently mounted publicity campaigns to persuade more motorists to car share. Cars account for a huge percentage of our greenhouse gas emissions so any scheme that reduces the amount of traffic on our roads has to be worthwhile. It can also increase personal safety if you walk to and from the car with a friend or colleague. According to the British Association of Insurance Brokers, car sharing won’t make your insurance costs any higher – assuming that you don’t profit from it and the vehicle is not intended for eight passengers or more. Many larger organisations now promote car sharing and help their staff to find car sharing partners. If you work for a large employer which doesn’t currently promote it, then ask if a scheme could be set up. Even if you don’t have a car or don’t drive you can still car share. According to government figures, around 60 per cent of drivers said they would be happy to share their vehicle if a suitable partner was available. Although car sharing to work is one of the most publicised journeys, there are lots of others which are suitable for car sharing such as weekly coffee mornings, shopping trips and leisure activities and major shows and festivals. If you are a parent there are many extra car sharing opportunities including journeys to and from school, trips to take children to birthday parties or weekly events such as swimming, gymnastics or football. An added bonus is that if you take turns with two or three other parents, you can get a lot of extra free time on the days that you are not responsible for the driving. For example, if the journey to swimming lessons takes 30 minutes each way you will have an extra hour of personal time. If you don’t know anyone who could car share to work or events, there are a number of websites where you can search for suitable partners for both regular and one-off trips.